Top 5 Flowering Trees for SoCal - Enjoy The Summer Blooms! Soak up the California sunshine and take in the colorful scene that flowering trees create. Right now, neighborhoods are coming alive with a burst of colorful flowers thanks to a few of our favorite trees. When not much else is blooming in the summer, trees such as Crape Myrtle, Jacaranda, and Magnolia can come to the rescue. Crape Myrtle varieties are starting to blossom, and Lagerstroemia bloom when the heat arrives! The show of colorful flowers ranges from lavender-pink to coral-pink, red and snow-white. Jacaranda is another one of the flowering trees we love to witness in SoCal. Perhaps you have driven in a neighborhood that looks as if it is painted in purple? Jacaranda mimosifolia blooms beautiful purple flowers that create a picturesque scene wherever they are planted, which is why people love to plant them as street trees. Yes, flowering trees can light up neighborhoods with color. And, they don’t just bloom the flowers that bring joy and color to neighborhoods – they also create shade! That’s right. Flowering trees such as the Tipuana tipu can create a cool shady spot in your yard with golden blooms, too! Shade and beautiful blooms; what’s not to like about flowering trees! Crape Myrtle (Lagerstroemia spp. ): These are valuable ornamental trees ideal for any size yard! These are perfect small trees for Southern California. After all, they are drought tolerant and love the heat. Since they never get too big, they can be planted in almost any spot in your yard. And, unlike some other trees, the colorful bloom lasts during the warmer months, which can stretch well into November. We offer hybrid varieties that are mildew-resistant so that they are ideal for our coastal communities. There are a few varieties to look for. Dynamite Crape Myrtle is a favorite, especially when the explosion of blood red flowers appears. Natchez is a variety that blooms pure white flowers all summer and into the fall. People love the sight of the Muskogee Crape Myrtle, especially when the bloom of lavender-pink flowers appear, softening the look of any landscape. 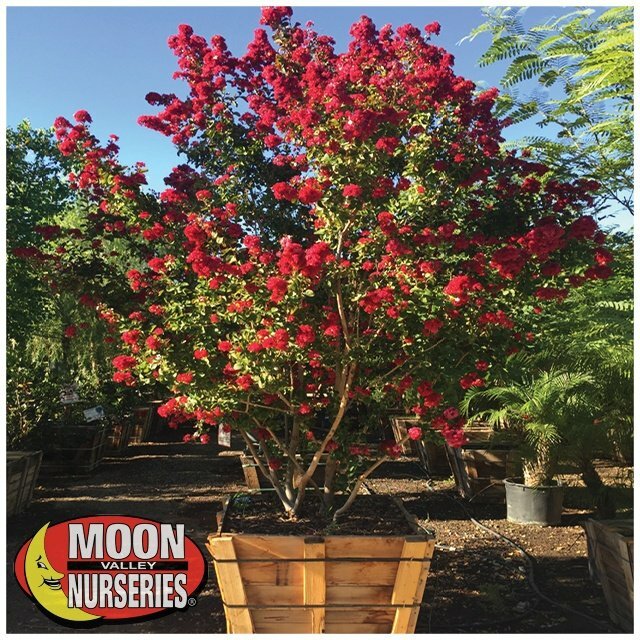 Tuscarora is a variety of Crape Myrtle that can produce a profusion of coral pink flowers that attracts hummingbirds and butterflies, too. Tipu (Tipuana tipu): When the warmer weather hits, you will love having a Tipu tree in your yard. These are colorful flowering trees that can create a massive amount of shade! Relax under a beautiful shade tree, no matter how bright it is outside! The golden blooms appear in late spring and last into early summer. The flowers are undoubtedly impressive, and its feathery, bright bluish-green foliage adds flavor to this showy tree. We like to plant the Tipu tree near patios and as a lawn or street tree. Tipuana tipu trees thrive in the heat. Buy a specimen size tree for maximum benefit! 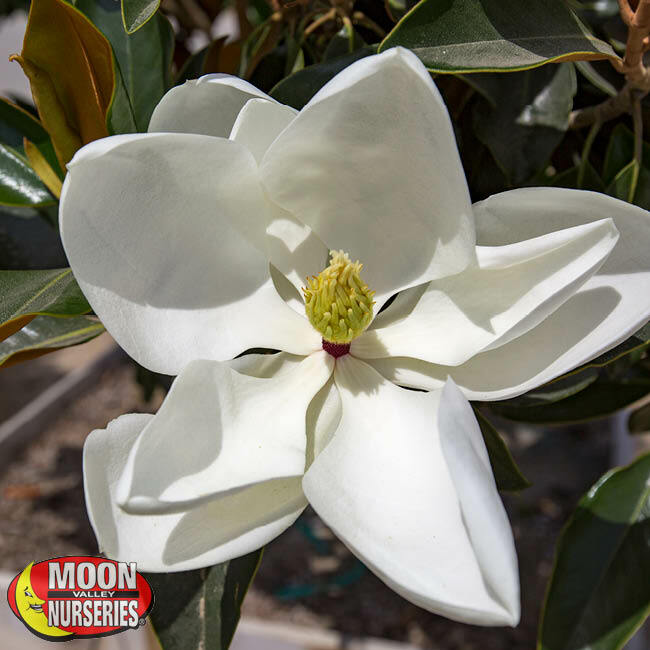 Magnolia (Magnolia grandiflora): Magnolia trees are a staple in many Southern California neighborhoods. They are dense, evergreen shade trees that bring lots of color and beauty to yards and streets throughout the Southland. Right now, it is not unusual to see Magnolia trees blooming large and fragrant white flowers. The blooms contrast beautifully with the glossy green leaves! The Little Gem and Teddy Bear are favorite varieties for smaller yards. The D.D. Blanchard Magnolia tree is waterwise, heat tolerant and cold hardy, making it an excellent tree for SoCal yards! Buy a specimen size tree and enjoy the shade coverage no matter how bright it gets outside. Jacaranda (Jacaranda mimosifolia): When Jacarandas are in bloom, you can’t help but take notice! In mid to late spring in Southern California, the lavender blossoms seem to be everywhere you go. You can’t help but admire the soft lavender pastel colors. The vibrant purple, bell-shaped flowers attract hummingbirds, too. Yes, the colors and the scene it creates are beautiful, and they get bonus points for providing shade. That’s right. This gorgeous tree features fern-style foliage, and a wide-spreading canopy that produces soft, filtered shade so that you can admire its beauty no matter how bright it gets outside. 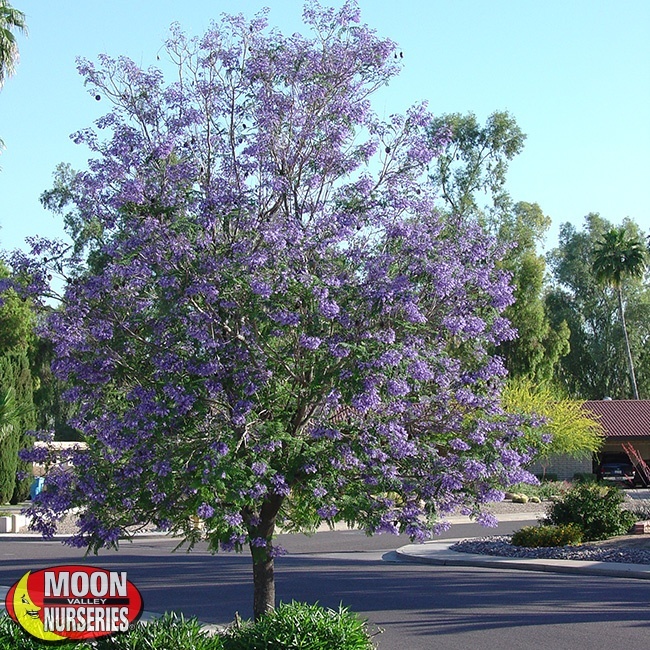 This is our number one selling variety of flowering tree, and one that is sure to be a favorite in your neighborhood. 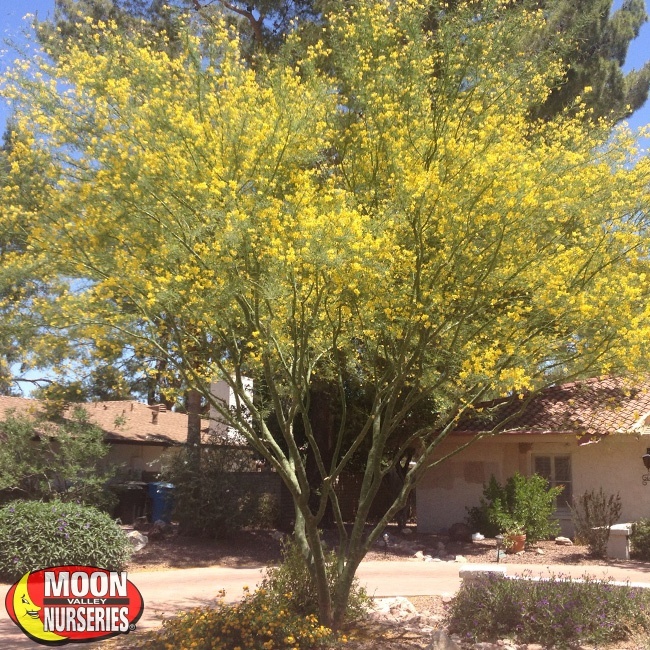 Museum Palo Verde (Cercidium x ‘Desert Museum’): Enjoy a dazzling springtime display of yellow when the large blossoms make an appearance. It’s not just the bloom that gets all the attention. When the leaves drop, they reveal a vibrant green trunk and stem that adds year-round interest. And, unlike other Palo Verde trees, this is a thornless hybrid that produces very few seedpods. Create a magical scene in your yard. These deciduous trees look incredible when lit up with landscape lighting! Of course, summer is coming, and this is an excellent upright shade tree that can create a comfortable spot in your yard. Right now, is the best time to purchase flowering trees. 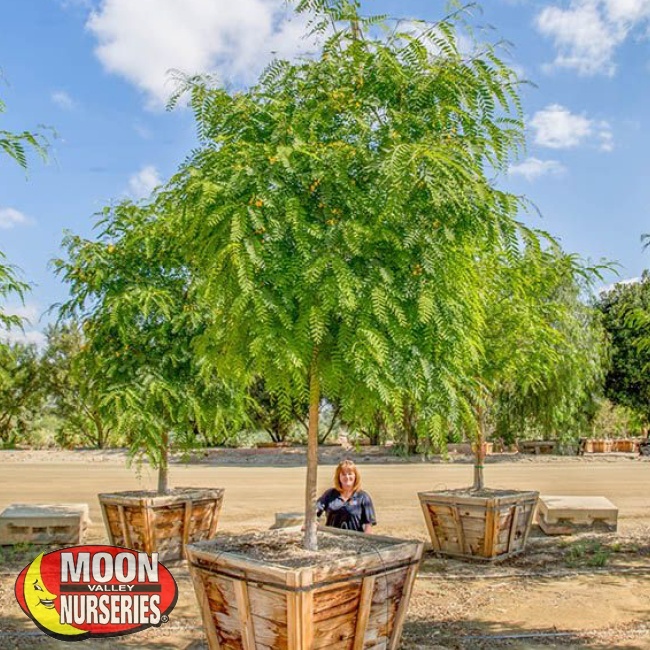 We have them available in a variety of sizes, from young starter trees to specimen sized trees that are ready to add instant beauty and shade! Ask us how! Visit your nearest Moon Valley Nurseries location and take advantage of our buy 5 and get one free tree deal! Plus, you get free planting on all six trees, huge size or larger! That’s right. We make it easy. Allow our nursery pros to help you select the perfect flowering trees, palms, and other trees for the perfect spot in your yard. Our professional planting crew will ensure that your trees are planted right so that they can thrive!